Volvo’s lineup continues to expand with the introduction of the new 2015.5 Volvo V60 Cross Country. 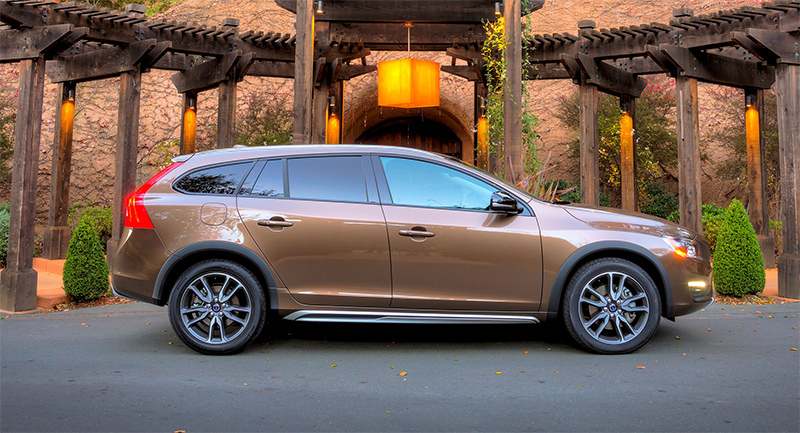 This sporty and dynamic luxury wagon, based on Volvo’s new-for-2015 V60, is the next generation of Volvo’s acclaimed Cross Country line offering all-road, all-weather driving capability, distinctive design and sophisticated safety and connectivity features. As a pioneer in the premium wagon segment, Volvo blazed a new trail when it introduced the first V70 Cross Country nearly 20 years ago. Combining the traditional Volvo wagon virtues of comfort, safety and utility plus sporty style, increased ground clearance and charisma, the V70 was ahead of its time. 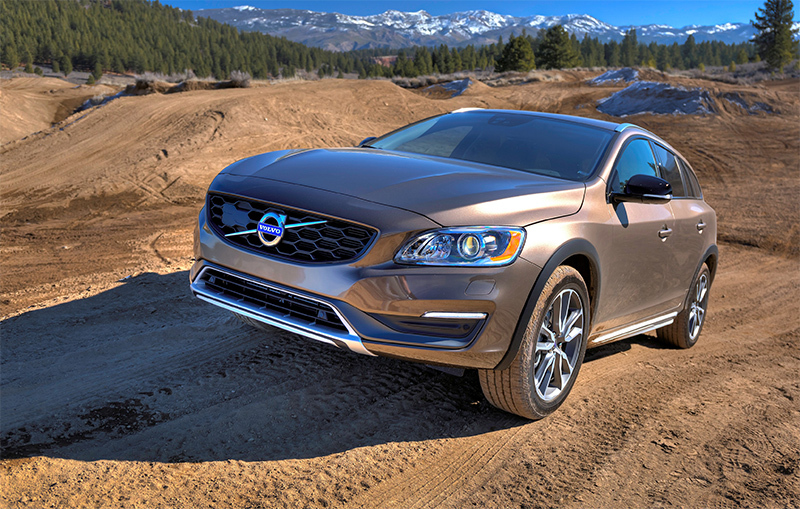 The new V60 Cross Country continues this legacy while embarking on a bold new road. Volvo’s designers artfully crafted the next generation Cross Country by applying signature design cues to the solid foundation of the V60 wagon. These elements combine to give the new V60 Cross Country a look that captures the hearts of drivers longing to “go anywhere” while attracting a new generation of customers to the Volvo family. Up front, the V60 Cross Country receives a new honeycomb grille and lower skid plate. The side is accented with new scuff plates, and black fender extensions that house exclusive 18-inch NESO Cross Country alloy wheels. Glossy black window trim and outside mirror covers contribute to the sporty elegance. At the rear, a lower skid plate provides the finishing touch while rear park assist is standard. From every angle, the new V60 Cross Country projects a sense of purpose and freedom, reflecting active lifestyles while providing sporty control and adventure for drivers. To endow the new V60 Cross Country with the ability to traverse roads off the beaten track, Volvo’s engineers increased its ground clearance by 2.6 inches (65mm) for total ground clearance of 7.9 inches (201mm). Offered in two well-equipped models, the V60 T5 AWD Cross Country and V60 T5 AWD Cross Country Platinum are powered by Volvo’s signature 2.5-liter five-cylinder turbocharged engine that produces 250 horsepower @ 5,400 rpm and 266 lb.-ft. of torque @ 1,800-4,200 rpm. This engine is mated to an efficient six-speed “Geartronic” driver adaptive automatic transmission with Sport Mode. Volvo’s electronically controlled All-Wheel Drive with Instant Traction™ is standard providing the best possible grip in all situations – on wet, slippery or completely dry roads. The advanced Haldex® AWD system delivers power to the wheels with the best grip. When a tire loses traction, power is reduced to that wheel and instantly transferred to the more sure-footed wheels. Standard Hill Descent Control uses the vehicle’s brakes and engine torque to crawl in bottom gear on steep downhill slopes. This makes it possible for the driver to focus completely on driving when descending steep hills. The driver can control the speed with the brake pedal or the accelerator when Hill Descent Control is activated. V60 Cross Country rides on new standard 18-inch NESO Cross Country alloy wheels with 235/50-R18 tires adding comfort and off-pavement aesthetics, reducing road noise and providing added wheel protection whether climbing curbs or negotiating rocky roads. From features that support drivers to features that help prevent accidents and protect drivers and passengers in the event that one occurs, IntelliSafe is Volvo’s way of giving its customers everyday convenience and peace of mind, wherever they go. The V60 Cross Country is equipped with Volvo’s high-tech safety solutions that actively help the driver avoid accidents and help protect the occupants if an accident is unavoidable. Standard safety systems include City Safety, a world-first technology that made its debut on the Volvo XC60. City Safety is a driver support system aimed at preventing or mitigating collisions with a vehicle ahead occurring at speeds of 31 mph or less. It utilizes a closing velocity sensor to help determine whether a collision is likely. Depending on the closing speed, City Safety will either pre-charge the brakes or automatically brake the V60 Cross Country to help avoid a rear-end collision or lessen its impact. Dynamic Stability and Traction Control (DSTC) is part of a suite of electronic systems to help optimize handling and control. Advanced Stability Control uses a roll angle sensor to detect and react to oversteer and understeer at an earlier stage. These situations may occur if the driver suddenly releases the accelerator while steering, such as when leaving a highway slightly too late. It also improves handling in evasive maneuvers. DSTC includes a sport mode setting to allow controlled wheel slip for performance driving. In the event of an emergency maneuver, Roll Stability Control (RSC) can step in to help prevent the vehicle from rolling over. It features a gyroscopic sensor that registers the vehicle’s lean angle and rollover risk. If required, RSC will cut engine power or brake one or more of the wheels just enough to reduce the centrifugal force and help regain balance. Corner Traction Control by Torque Vectoring is another standard technology to help improve handling by redistributing torque to the outer wheel to help “steer” the car around a turn. This feature operates on both the front and rear wheels for the V60 Cross Country. Enthusiast drivers will immediately notice a significant reduction in understeer as the system seamlessly applies the appropriate amount of power to the outside tire(s). Pedestrian and Cyclist Detection with Full Auto Brake, offered on all V60 Cross Countries with the available Technology Package, is a groundbreaking technological solution that actively helps the driver to avoid accidents. Volvo’s radar- and camera-based system can detect pedestrians in front of the car, warn the driver if anyone walks out into its path and then automatically activate the V60 Cross Country’s full braking power if the driver fails to respond in time. New advanced software with more rapid vision processing enables the system to cover certain cyclist situations as well. If a cyclist heading in the same direction as the car suddenly swerves out in front of the car and a collision is imminent, there is an instant warning and full braking power is applied. 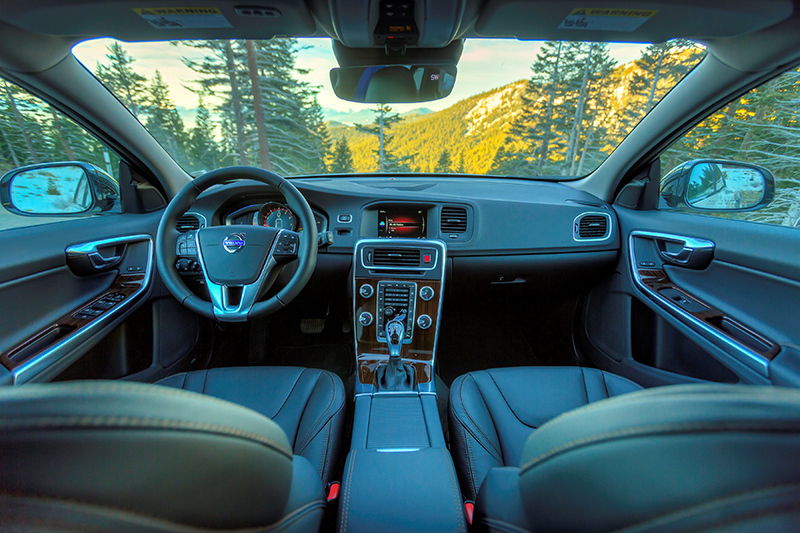 The new V60 Cross Country provides a comfortable and luxurious environment for the driver and passengers whether they’re driving to dinner or embarking on a road trip to explore the great outdoors. 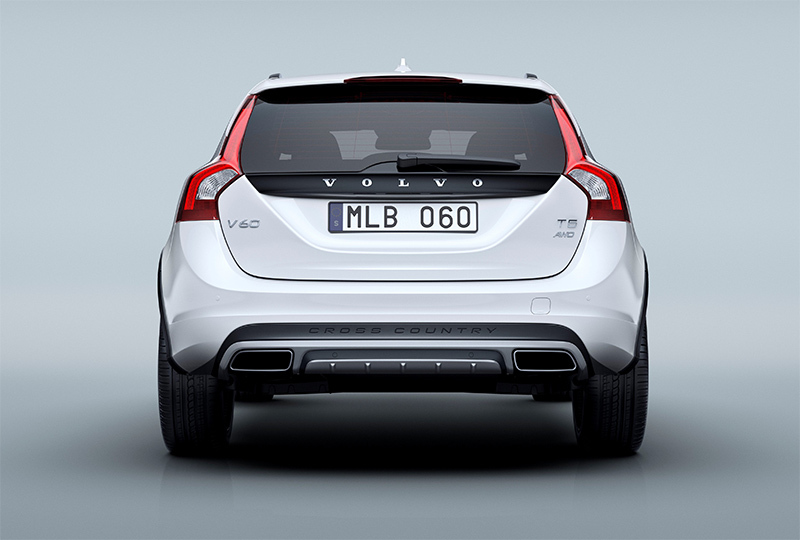 All V60 Cross Country models are fitted with standard contour seats that provide excellent comfort and support. Standard Cross Country leather seating surfaces with contrasting stitching are available in the hues of Off-Black, Soft Beige or Beechwood. The cabin is enhanced with standard Shimmer Graphite inlays while Urbane Wood or Piano Black Wood inlays are available as individual options. 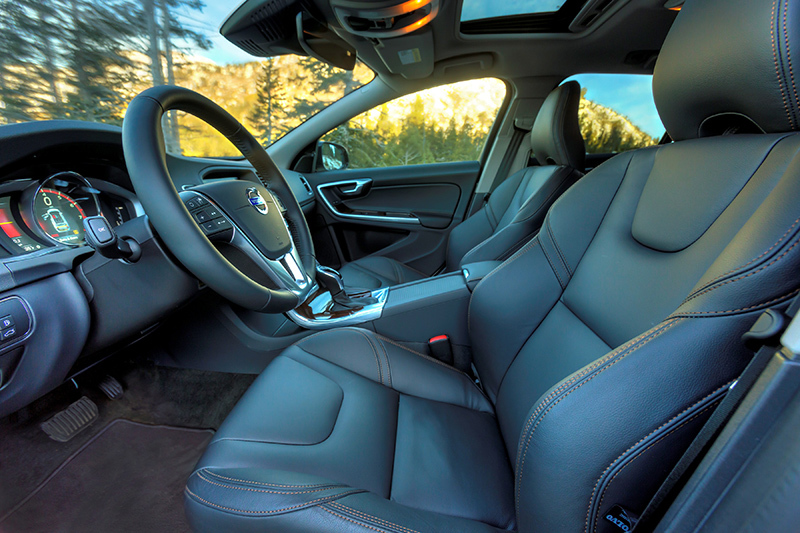 Like the V60 wagon, the V60 Cross Country is equipped with a standard 40/20/40-split rear seat that increases versatility for transporting cargo. Each backrest in the three-piece rear seat is folded with exceptional ease to create a flat load floor. The load area has been designed for maximum utility with access via a wide tailgate plus extra space for smaller items behind the wheel housings and under the load floor. Maximum cargo capacity is a generous 43.8 cubic feet. All V60s are equipped with the Volvo Sensus system. Sensus manages information from the audio unit, standard navigation and other functions, displaying them onto a seven-inch high-definition color monitor in the upper part of the center console. It allows the driver to explore the high-tech features of the car and personalize them to suit his or her needs. A standard high-performance audio system includes a CD player, HD Radio, AUX and USB inputs, MP3 capability, 160-watt amplifier and eight speakers. Also included is Bluetooth hands-free phone interface with audio streaming and Sirius Satellite Radio with a complimentary six-month subscription. The new Harman Kardon Premium Sound System is standard on the V60 Cross Country Platinum trim and available as an individual option for the base model. Volvo’s audio experts worked closely with world-renown Harman Kardon to create one of the best sounding systems in its class. Customers will experience a richer, clearer and more faithful sound wherever they are in the car thanks to innovative Dirac Live® technology. Details include:A five-channel Class-D amplifier with 130 watts for each channel providing superior power reserves for a wide dynamic range. Sound tuning with Dirac Live® provides an exceptional sound reproduction in the entire audible frequency range. Rich bass performance even without a subwoofer due to extended low bandwidth. Low distortion midrange speakers and mid-woofers with optimal damping characteristics. 25mm cloth dome tweeter with high sensitivity for a perfect interplay with midranges and woofers. Low pass filter on front woofer to ensure better separation between midrange and woofer. Improved midrange with wider bandwidth to optimally play together with front woofer. Midrange Speaker both for center and door yield an excellent tonal response. Connection is achieved by internal modem, and includes a six-month trial service period. Beyond that, the system can also be connected via the personal hotspot in the owner’s smartphone utilizing the customer’s existing data plan, and requires tethering capabilities within the customer’s plan. Sensus Navigation – The V60 Cross Country’s standard Sensus Navigation system integrates all navigation functions into the car. The system is easy to use, without taking attention from traffic and adding to the overall safety of the system. Sensus Navigation provides all the functionality of Volvo’s previous navigation system and doesn’t require a Sensus Connect subscription. However, when such connection exists, the system provides a much more robust user experience and fully integrates with the built-in apps. Free mapcare updates can be downloaded by the customer from any computer to a standard memory stick then easily downloaded into the car. The map data is updated twice per year. Volvo On Call – Allows owners to enjoy the possibilities of in-car connectivity, the standard 3G-based Volvo On Call provides powerful reception by making use of the car’s rooftop antenna (monthly data charges apply after six-month introduction trial expires). The driver doesn’t need a smartphone onboard to have access to the cloud-based Volvo services. Users can easily connect smartphone, laptop or tablet to the internet. With the Volvo On Call road assistance and convenience service, the owner can also have a great app to connect their Volvo with their smartphone. Owners can use their smartphone (iPhone and Android) to check the status of the car, lock and unlock the doors and even start the engine to warm up or cool down the interior before driving. Customers have the added convenience of selecting from an array of packages and individual options for the V60 Cross Country. Climate Package – includes a heated windshield, heated steering wheel, heated front seats, heated rear seats, heated windshield washer nozzles and Interior Air Quality System (IAQS). Convenience Package (included with Platinum trim) – includes Keyless Drive, rear park assist camera, HomeLink®integrated garage door opener, digital compass, grocery bag holder and power retractable outside mirrors. Technology Package (included with Platinum trim) – features Volvo’s most advanced driver support systems including Adaptive Cruise Control with Queue Assist, Collision Warning with Full Auto Brake, Pedestrian and Cyclist Detection with Full Auto Brake, Distance Alert, Driver Alert Control, Lane Departure Warning, Road Sign Information and Active High Beam. Blind Spot Information System (BLIS) Package – includes Blind Spot Information (BLIS), Cross Traffic Alert, Front Park Assist and Lane Change Merge Aid. Individual Options – Metallic paint, heated front seats, Urbane Wood inlays, Piano Black Wood inlays, accessory prep cable, Keyless Drive (included with Platinum trim), dual two-stage child booster seats with power child door locks, Harman Kardon Premium Sound (included with Platinum trim) and dual screen rear entertainment system.